પુત્રદા એકાદશીના દિવસે વિશેષરુપે દીપદાન કરવાનું વિધાન છે. રાત્રેવૈષ્‍ણવ પુરુષો સાથે જાગરણ કરવું જોઇએ જાગરણ કરનારને એ ફળ મળે છે કે જે ફળ હજારો વર્ષની તપસ્‍યા કરવાથી પણ નથી મળતું. આ બધા પાપોને હરનારી ઉત્તમ તિથિ છે. ચરાચર જગત સહિત સમગ્ર ત્રિલોકમાં એના કરતા મોટી કોઇ તિથિ નથી. બધી જ કામનાઓ અને તિથિઓના દાતા ભગવાન નારાયણઆ તિથિના અધિષ્ઠિતા છે. પૂર્વકાળની વાત છે. ભદ્વાવતી પૂરીમાં રાજા સુકેતુમાન રાજય કરતા હતા. એમની રાણીનું નામ ચંપા હનું. રાજાન, ઘણા સમય સુધી વંશ ચલાવનાર પુત્રની પ્રાપ્તિ ન થઇ. આથી પતિ-પત્‍ની હંમેશા ચિંતા અને શોકમાં ડુબેલા રહેતા. રાજાના ,પિતૃઓ એમના આપેલ જળને એકી શ્વાસથી ગરમ કરીને પીતા. “રાજા પછી એવું કોઇ નથી દેખાતું જે અમારું તર્પણ કરે.” આમ વિચારીને પીતૃઓ શોકમાં રહેતા. એક દિવસ રાજા ઘોડા પર સવાર થઇને ઘોર જંગલમાં ચાલ્‍યા ગયા પૂરોહિત વગેરે કોઇને આ વાતની ખબર ન હોતી. મૃગ અને પક્ષીવાળા એ ઘોર જંગલમાં રાજા ભ્રમણ કરવા લાગ્‍યા. માર્ગમાં કયાંક શિયાળનો અવાજ સંભળાતો હતો તો કયાંક ઘુવડનો. જયાં ત્‍યાં રીછો અને મૃગો દ્રષ્ટિગોચર થઇ રહ્યા હતા. આ રીતે ફરીને રાજા વનની શોભા જોઇ રહ્યા હતાં. એવામાં બપોર થઇ ગઇ. રાજાને ભૂખ અને તરસ સતાવવા લાગી. રાજા પાણીની શોધમાં આમ તેમ ભટકવા લાગ્‍યા. પુણ્ય પ્રતાપે રાજાને એક સુંદર સરોવર દેખાયું. એની નજીક મુનિઓના ઘણા આશ્રમો હતા. સૌભાગ્‍યશાળી નરેશે ઓ આશ્રમ તરફ જોયું. એ સમયે શુભની સુચના આપનારા શુકનો થવા લાગ્‍યા. રાજાનો જમણો હાથ અને જમણું નેત્ર ફરકવા લાગ્‍યા. ઉત્તમફળની એ ખબર આપી રહ્યાં હતાં. Say the greatness of the Ekadashi of the month of Shaukal party. What is that name? What is the procedure for its vow? Which god is worshiped? "Bhagwan said," Rajan! The Ekadashi of Posh month Shukal Party Its name is "Sonada". 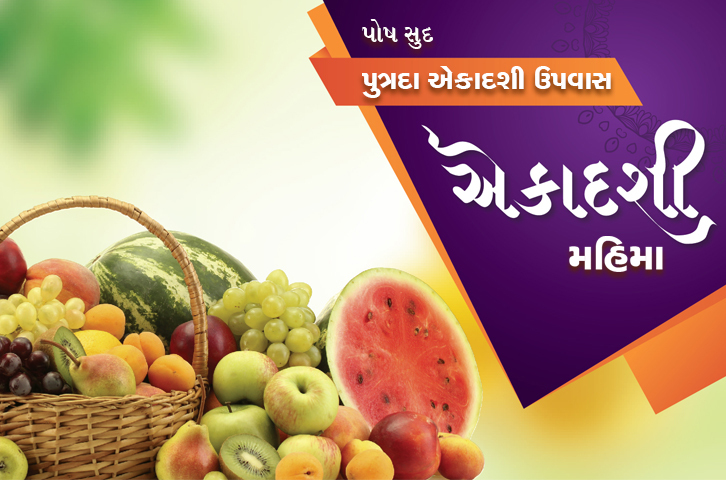 On the day of sonda Ekadashi, worshiping the names of mantras and praising Shrihari by fruits. Goddess Devshavar Shree Lahiri should be worshiped with mango, green peas, beetle, bijora, lemon, jamich, lemon, pomegranate, beautiful aambo, clove bore and in particular. Similarly, it should be done by milking Deepa. " On the day of sonda Ekadashi, it is a special way of giving deep gratification. Night watch should be done with the men, the vigilant gets the fruit that does not get even from the fact that thousands of years of age are established. All these sins are the best of the eleven. There is no bigger picture than that in the whole trilogy including the alien world. All the work and donors of the Gods are the authorities of Lord Narayana Tithina. It is a matter of the past. King Suketaman was in the state of Bhadvati. His queen is named Champa. Rajan The son of a prolific son has not been long. So husband and wife always remain worried and shocked. Raja's, enemies, heated the water given to them by drinking echoes. "After the king, there is no one who does not see us." A bicuspée left the horse on horseback and went to a deadly forest, and no one knew about this. Raja started roaming in a deadly forest in the forest of Riviera and Bird. If the sound of a fox was heard on the way, Wherever there were chaos and corpses going dark. In this way, the King was watching the forest. It was noon. The king started to suffer hunger and thirst. The king started wandering in search of water. The king saw a beautiful lake in Pune. There were many monks of Munni near this. Sadbhavya Naresh looked towards the ashram. At that time, the scholars started offering good wishes. The right hand and the right eye of the king began to differ. The good news of the good news was giving. Many seers were teetering on the banks of the lake. The king was very happy to see him. They descended from horses and stood by the monks and began to sing the songs of various kinds. These demons were adherent of an excellent vow. When the king repeatedly bowed his hand, the monks said, "Rajan! We are pleased with you. "The king said:" Who are you? What are your names? And why have you gathered here? Please tell me all this. " Muniyo said: "Rajan! We are people Vishwadev. Come here for a bath. The month is near. From today on the 5th day the bath of the month will begin. Today is the land of the name "Sonada". The son gives the son to the vow. The king said: "Witworth! If you are happy, give me a son. " Munni said: "Rajan! On today's day there is Ekadashi named Sonada. Its vow is very popular. You make this excellent diary today. Lord Krishna says that you will have a son there with Lord Prasad of Lord Keshav. "According to this, the leave of the devotees has given excellent excellence. Worshiping son of Goddess Ekadashi, according to the teachings of the Mahishans. Then, on the twentieth day, Raja came to his house by hanging his head on the feet of the Munis. Then the queen took her as a pregnant woman. When the time of delivery came, the king received the glorious son. He satisfies his father with his qualities. That person became a guardian. " Excellent practice of sonda ekshi should be done. I have described the interest of the people for you. The person who performs the vow of Sonada Ekadashi, who collects a son, says, "He gets a son in this world and receives the heaven after death. Reading and listening to this Mahatmya results in the fire of Agnihom Yan. "